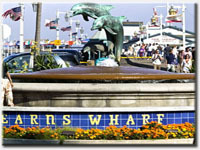 Santa Barbara Tour - Los Angeles Tours - Your guide to best sightseeing places in LA! Year round: 9:30 a.m. free Los Angeles hotel pickup*. 2 people minimum to book a tour. Avoid large tour buses & enjoy the heart of the Santa Ynez wine country, home to several very popular California wineries. This trip is a great opportunity to sample/learn about the region's best wines. Let us take you back in time and guide you through the roads less traveled!! Located just 90 miles north of Los Angeles, Santa Barbara is a world apart, and offers a soothing realm of distinct and subtle pleasures, and an intoxicating appeal that arises from the convergence of elements found perhaps nowhere else in the world. Santa barbara is a city of white-washed buildings with red tile roofs tucked between the mountains and the sea, laid back Santa Barbara resonates with an irresistibly sensuous allure. Santa Barbara, sometimes referred to as the American Riviera, is a thriving community of culture and vineyards has both a traditional conservative side, as well as a more relaxed libertarian character among the younger adults. Santa Barbara region is rich with attractions, historic monuments, world-renowned wineries in Santa Ynez, Los Olivos and Solvang, internationally famous architecture and much more. It is home to the three of the 21 missions established in California by Spanish conquistadors. 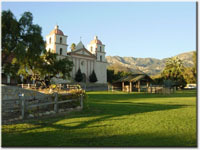 Our tour offers travelers an opportunity to learn about Santa Barbara Wine Country true history and beauty. 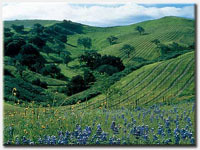 This tour will offer Wine Country historical formation and current facts. 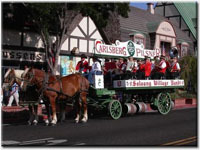 In addition, we will also visit: lots of scenic areas, Danish Village of Solvang, Mosby Winery and experience wine sampling. Sit back, relax and enjoy the personal service that is the cornerstone of our tours. Our friendly, knowledgeable team will make your tour to Santa Barbara Wine Country an experience you’ll remember forever. Visit historic Stearns Wharf, California's oldest working wharf dating back to 1872, and our bustling Santa Barbara Harbor, home to over 1,000 fishing and pleasure vessels, and your gateway to the breath-taking Santa Barbara Channel Islands. 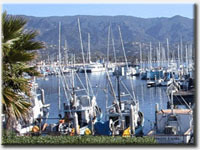 Downtown Santa Barbara offers myriad attractions and historical sites for visitors of all ages to explore. Rich in reminders of its colorful past, Downtown is a mix of historic adobes and outdoor courtyards, with a display of contemporary sculpture set among the Mediterranean architecture. Come to discover the warm hospitality of the "Danish Capital of America". 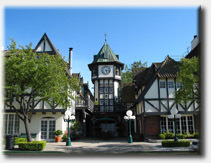 Solvang was founded in 1911 by a group of Danish educators. The settlers of this city left for the west to escape midwestern winters. The city is home to windmills, bakeries, restaurants, and merchants offering a taste of Denmark in California. 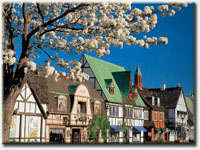 The architecture of many of the buildings follows traditional German style. There is a copy of the famous Little Mermaid statue from Copenhagen, as well as one featuring the bust of famed Danish fable writer Hans Christian Andersen. 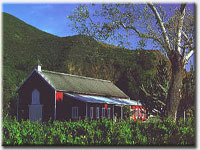 The Mosby winery, estate and vineyards —one of the earliest wineries in Santa Barbara County. The land is part of the old Rancho de la Vega, which derives its name from the Spanish "river bottom or meadow." Hence, Bill Mosby's first commercial wines were labeled "Vega." Because of its location, the de la Cuesta ranch home was a favorite place for travelers to rest before facing the long trip by horseback through the Santa Ynez Mountains since there was no hotel between San Luis Obispo and Santa Barbara. The gracious de la Cuesta hospitality was known throughout California and the adobe ranch house was a favorite stopping place for travelers in the sparsely settled state of more than 100 years ago. *Our Santa Barbara private tour location is close to the following geographic areas: Los Angeles,Beverly Hills,Westwood,Hollywood,West Fairfax,Mount Olympus,West Beverly,Burbank,Bel Air Estates,Century City,West Hollywood, Hollywood Hills ,Beverly Glen,Pepperdine University,Malibu,Topanga, Santa Monica,Calabasas,Hidden Hills,Canoga Park,Winnetka,West Hills,Canoga Park,Chatsworth,Sherman Oaks,Encino,Northridge, Reseda,North Hills,Granada Hills,Tarzana,Westlake Village,Woodland Hills,Universal City,North Hollywood,Valley Village. *Our Santa Barbara private tour location is close to the following attractions: KODAK Theatre Guided Tour,Autry Museum of Western Heritage,California Science Center,CBS Television City,Dodger Stadium, Farmers Market, Graumans Chinese Theatre, Hollywood Entertainment Museum, Hollywood Guinness World of Records,Museum of Flying, Museum of Tolerance, Paramount Studio Tour,Petersen Automotive Museum Tour,Sunset Boulevard, World Famous Hollywood Wax Museum,UCLA at the Armand Hammer Museum of Art & Cultural Center,Universal Studios Hollywood, Warner Brothers Tours,Wells Fargo History Museum, NOKIA Theatre L.A. LIVE, Los Angeles Zoo & Botanical Gardens,Getty Center,Broad Contemporary Art Museum at LACMA, The Huntington Library, Art Collections, and Botanical Gardens,Ronald Reagan Presidential Foundation & Library,Six Flags Magic Mountain,Wild Rivers Water Park,Pacific Park on the Santa Monica Pier, Aquarium of the Pacific, Queen Mary,Sony Pictures Studios Tour, Guinness World Records Museum.